Thank you! I had been trying for two days to get this to work but was missing the critical "Upload using programmer" step. Great! Yeah, it seems like it should be really simple, but finding instructions was surprisingly Google-resistant. I'm glad it's working for you! Works great on my Uno R3! The 22uF to cancel the reset did the job also. Is there a way to debug your code using a serial connection? That is, if you've got Serial.println("Debug stuff here"); points in your code, and you'd like to see them -- can you wire the Serial data pins in such a way that you could see that through the Arduino serial console? Thanks a lot for this blog, it worked at once on my uno-rev3. I didn't remove pin 21 to GND and I didn't use a capacitor between reset and GND but that all didn't matter. Glad it worked and thanks for the report on what worked for you! 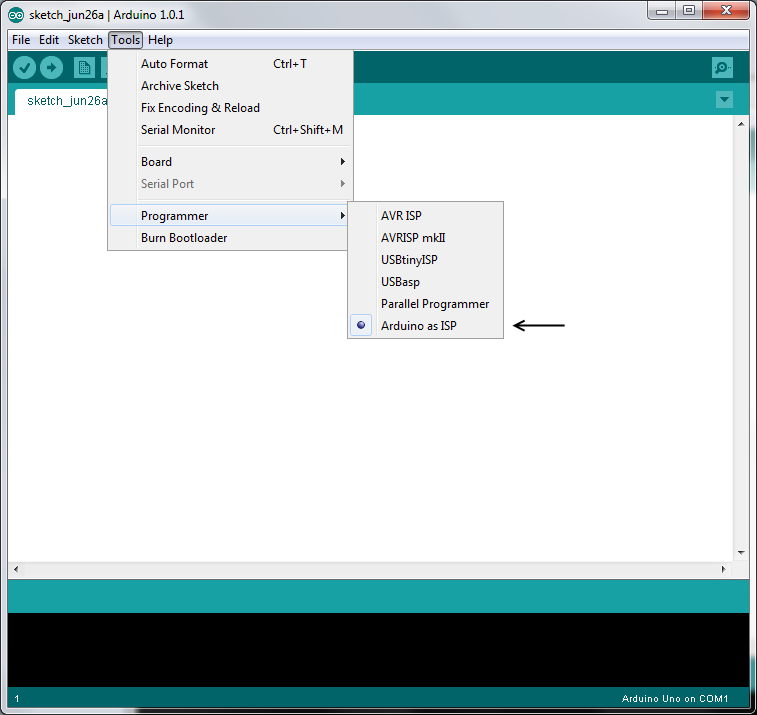 very useful, i do have Arduino UNO R3 and follow your instruction and it was successful i did load a sketch to my ATMega328-Pu, but i did not put a caps on my arduino auto-reset to disable it where you said you put 22uF capacitor between the reset and the Gnd pin since i dont have any of those caps value by that time. Does it make any side effect on my arduino board? coz ill be loading more sketches on that set up from time to time now. If it works, I don't think you have anything to worry about. The purpose of that capacitor is to prevent the reset line from being pulled low (I think) upon USB connection (as would occur when programming the standalone chip). Wow! It worked like a champ!! Last several hours I have been looking for exactly this - loading a Sketch on standalone ATmega328P using my Arduino Uno with SMD ATmega328 which I cannot get rid of momentarily. You are very right no other tutorial seems to address this particular need. Thank you so much for your blog post, it saved me waiting for another good 15 days to get an FTDI from HongKong or China. 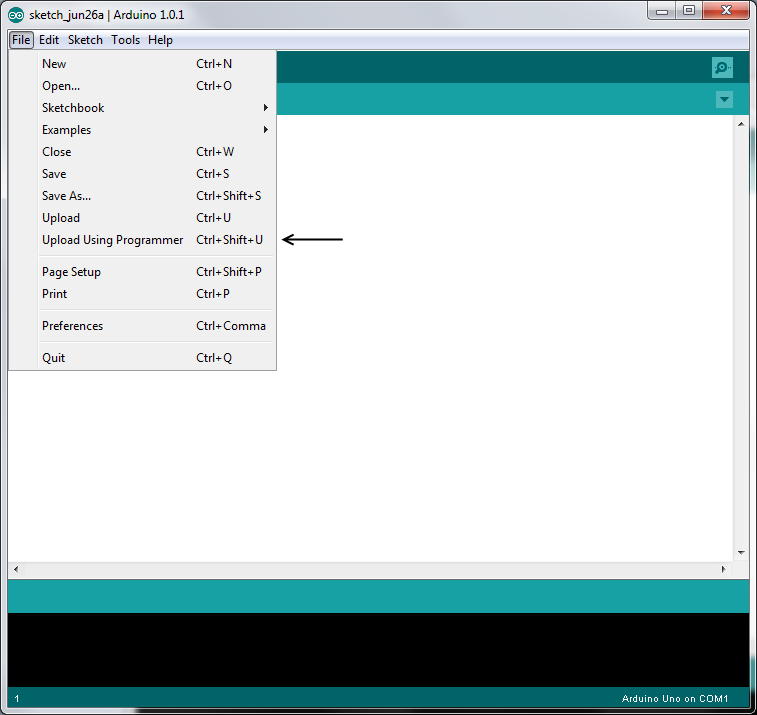 Here is my hardware and settings, just in case other people benefit from the info: Arduino Uno v.2 with SMD ATmega, Arduino IDE 1.0.5, Standalone ATmega328-P, Reset to ground via a 10uF capacitor - a successful recipe! (Sorry about my name in exotic alphabets, it is "Sayedur" in English. Would be nice if your tutorial showed how to do this without the crystal and capacitors. 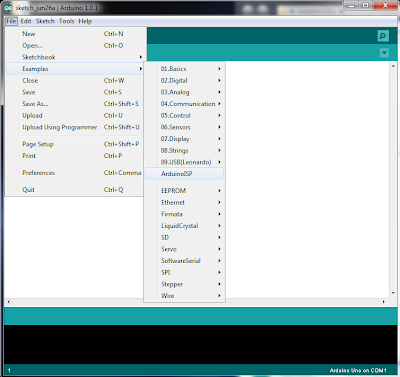 I've uploaded a bootloader without them, so it should be possible to also upload sketches without them too. Guess this isn't the tutorial I was looking for. For quite some time I am uploading sketches without crystal and capacitors. For this I have to bootload the Atmega328 at 8Mhz (internal). 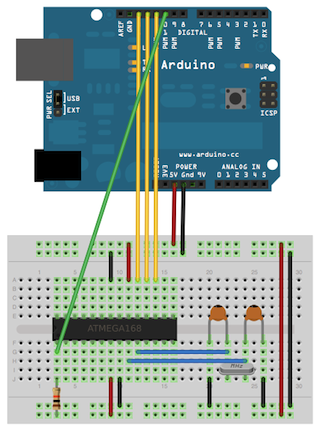 Then connect Arduino 11-13 to ATmega's 11-13, and Arduino's 10 to ATmega's reset (no resistor or capacitor needed here too). Download ArduinoISP on Arduino, afterwards select a board that runs at 8Mhz (e.g. Lilypad) and Upload using programmer. Did anyone get an "Invalid Device Signature" when using "Upload Using Programmer", If so; how did you solve it? Splendid! Tried this with the minimal configuration using 8MHz internal clock and breadboad.zip available from Arduinio website and it worked! Just had to choose board as "ATMega328 on a breadboard (8MHz internal clock)". Great post! "Upload Using Programmer" was the key!! would an 8mhz crystal work ? It was very easy and useful! It works! I don't use 22uF capacitor between the reset and the GND! I load sketches on two of my Atmega328P and it was OK! great!, is exactly the same what I'm looking for several days ago. Thank you very very much for sharing this information!! a last question: uploading a sketch in this form does not erases the bootloader? I'm new to arduino. I was searching for exactly this. Thank you very much.